We spent a good part of October touring our local mountains and picked a lot of wonderful apples, apples which ripened in the warm, sunny days and clear, frosty nights of the mile-high mountain air. Tops on our list was a Northern Spy tree in a 100-year-old orchard that gave the spiciest, deepest-red apples you could ever hope to taste. Along with those we also had Winesap, Rome Beauty, White Winter Pearmain, Yellow Newtown Pippin, Yellow Bellflower, Golden Delicious, and a new one for us this year, Northwestern Greening. But all those apples are now all eaten, or pressed into cider, sliced and dried, or sliced into a pie crust that’s frozen in the freezer, ready for baking at Thanksgiving or Christmas. They are but a fond memory of our fall vacation time. But our lowland apples are coming into ripening, and we are having an encore of some of those mountain favorites that give them a good run for their money. Granted, they aren’t quite up to the best of the best from the mountains; but neither is anything we can get in the store. However, if the mountain apples scored a perfect “10”, we’ve tasted some solid “8”s with our lowland apples that are just now ripening and promise to improve in the next couple of weeks. These are on M111-rootstock trees that have taken a few more years to come into bearing, but are promising to develop into a first-class apple orchard. A big surprise to us was Winesap, which hasn’t been productive in the past, but has often been suggested by Southern apple growers. This year the tree had a good crop of nice-sized apples with decent color. 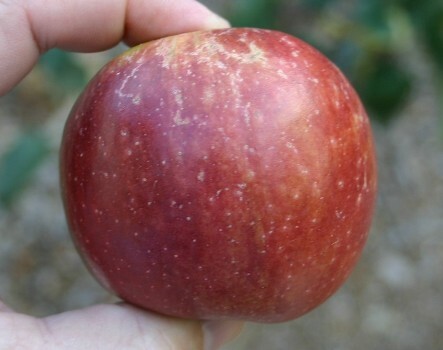 The flavor is classic Winesap, sweet-tart, juicy, spicy, crisp and zingy. The seeds were still a bit pale and so I’ll try again in a week or two, but they are definitely at the pie stage right now. GoldRush was also a zingy winner, almost like Fuji but with quite a bit more bite. The aroma was heavenly. I heard these improve in storage, and so I put a couple in the refrigerator. King David was still a couple weeks off from being ripe, but an honorable mention goes to Black Oxford. It is starting to resemble the specimens from Maine, its home territory, and the flavor was crisp, tender, but still a bit green with really pale seeds. We’ll also try that in a couple weeks too. Marty and I both remarked that even if one of these apples are this good in Uganda, all of East Africa will be beating a path to their door. 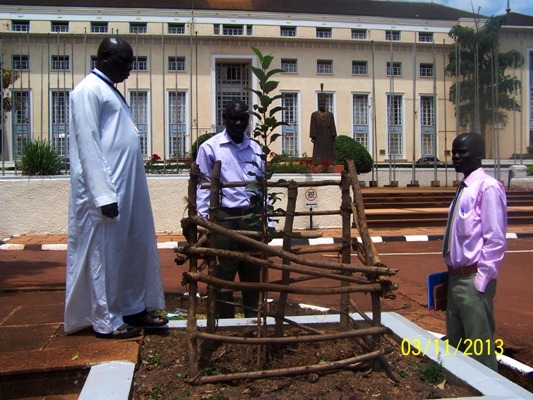 This is one of our apple trees planted on the main entry drive to Bulange Palace, Buganda Kingdom, Uganda (that statue to the right of the tree is His Majesty, Kabaka Ronald Edward Frederick Muwenda Mutebi II Kimera, Kabaka of Buganda). There’s a couple more on the front lawns and they’re causing a bit of excitement as they’re growing like weeds, something previously thought not possible at this low elevation in the tropics. It will be bearing apples in a year and I imagine that will also cause quite a stir.